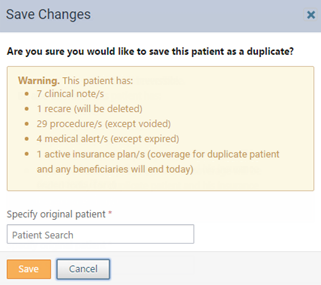 In the event that there are duplicate patients in your organization's database, you can mark one or more patient records as duplicates. A duplicate patient's record is not accessible from the search boxs that are available throughout Dentrix Ascend. However, you can verify if a patient has duplicates associated with him or her by accessing that patient's record. To mark a patient as a duplicate and to change the status from Duplicate to another status, you must have the security right to manage duplicate patients. On the Basic Info tab of the Patient Information page for the patient whose record is a duplicate, change the patient's Status to Duplicate. Note: You cannot save a patient as a duplicate if the patient has future appointments, has a balance, has any pending insurance claims, or is a primary contact or primary guarantor for another patient. The Save Changes dialog box appears. Clinical notes - No action will be taken. Recare - This will be deleted. Documents - No action will be taken. Procedures (except voided) - No action will be taken. Prescriptions (except voided) - No action will be taken. Medical alerts (except expired) - No action will be taken. Perio exams (except voided) - No action will be taken. Active insurance plans - Coverage for those plans will be ended (using today's date) for this patient and for any of the dependents for whom this patient is the subscriber of those plans. In the Specify original patient field, search for and select the patient whose record you want to keep as the correct one. The duplicate patient's record will be associated with the specified original patient. The only place that you can access the record of a patient that has been marked as a duplicate is from the record of original patient specified in step 3. 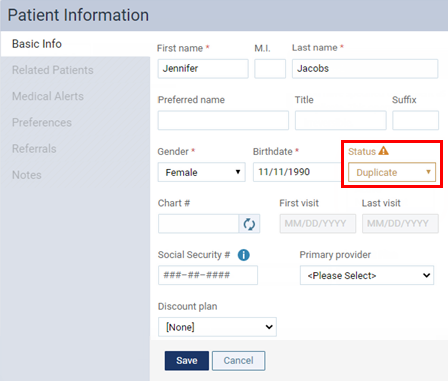 To open a duplicate patient's record, on the Basic Info tab of the original patient's Patient Information page, click (or tap) Duplicate patient(s) to view the associated duplicates, and then click (or tap) a patient name link. 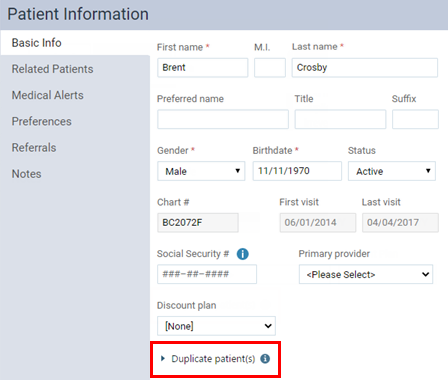 Note: While viewing a duplicate patient's record, a warning message appears at the top of patient's record to indicate that the patient whose record you are viewing is a duplicate.